Your Soul's Plan tells the stories of ten individuals who-like you-planned before birth to experience great challenges. Working with four gifted mediums and channels, author Robert Schwartz discovers what they chose-and why. He presents actual pre-birth planning sessions in which souls discuss their hopes for their upcoming lifetimes. In so doing he opens a window to the other side where we, as eternal beings, design both our trials and our potential triumphs. 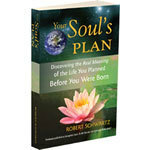 Your Soul's Plan: Discovering the Real Meaning of the Life You Planned Before You Were Born was previously published as Courageous Souls:Do We Plan Our Life Challenges Before Birth? After you purchase a book or books, you will receive an email confirming that your order was received. Please note, however, that we do not send an email notifying you that you order has been shipped, nor do we provide any tracking information. Special Note If You Live Outside the US: The least expensive shipping method for you is USPS Priority International Flat Rate Envelope; however, you may choose this shipping method only if you are purchasing ONE item. (The type of item does not matter.) If you are purchasing more than one item, please select another type of shipping. Thank you. Special Note if You Live In the US: During the checkout process you will be able to select from a variety of shipping options. The least expensive option is media mail, which does not provide a guaranteed delivery date. Also, although shipments by media mail take 2-9 business days during most times of the year, we have found that media mail shipments often take much longer (up to three weeks) during August (due to the number of Postal Service employees on vacation) and December (due to the large volume of gifts being shipped). If you are placing your order during August or December, or if you require a guaranteed delivery date, we suggest you choose a form of shipping other than media mail.